Well, another chess season has come to a close for me. It is time for me to move on to managing the website for my other hobby (https://spamfootball.webs.com/), but I will return after the football season ends. Before I go, I wanted to clean up some loose ends. Of course, you can still send in news items or articles during the off-season, and I will email them along to the subscribers. Any games I receive will be stored at the Colorado Springs Chess News’ Yahoo! group (https://groups.yahoo.com/neo/groups/cs_chess/info). You can also join the group to keep receiving chess games all year round. So, what happened in 2015 when my rating started to tumble back down from my peak? I started directing tournaments for the Colorado Springs Chess Club in 2015. It is not easy to direct and play well. I still haven't figured out how to find the balance between focusing on my game and taking care of the event duties. However, directing hasn't been all bad. Directing tournaments for the Colorado Springs Chess Club is a nice way to give back to the club I have enjoyed for 20 years. My largest pay day for chess was while I was a tournament director. I get a lot of material for my newsletter. And every once in a while, I get to see a game that just makes my year. Larry Osborn provided me with the most enjoyable game of the year. Since I play and direct, I didn't get any time to watch his game. However, my Vice President, Peter Barlay saw the ending and told me, "You are going to love this!" I went over the score sheet at IHOB, as I was uploading the ratings report to USCF at 2:00 am in the morning. I burst into laugher when I saw 14. Qh5+!!! It was not because of the blunder. It was because I knew Larry had won. It was not just an upset of a higher rated player. It was a comeback against a higher rated player after hanging his Queen! It was the chess equivalent of a hail mary pass. Instead of the "Minnesota Miracle," it was the Colorado Springs Miracle! I go over hundreds of games each year just hoping to find a game like this so that I can send LM Brian Wall a legitimate contender for the Jim Burden Award rather than my crappy, blitz blunders (https://cschess.webs.com/apps/blog/show/4007078-for-such-a-time-as-this). Here is my nomination for the 2018 Jim Burden Award. 6. Nf3 O-O 7. O-O Nbd7 8. Nbd2 b6 9. e4 dxe4 10. Nxe4 Nxe4 11. Bxe4 Bb7 12. Bxh7+ Kxh7 13. Ng5+ Kg6 14. Qh5+ Kxh5 15. f4 Be7 16. d5 cxd5 17. h3 dxc4 18.
g4+ Kh4 19. Kh2 Bd6 20. Be3 Bc5 21. Rf3 Ne5 22. b4 Nxf3+ 23. Nxf3+ Bxf3 24. 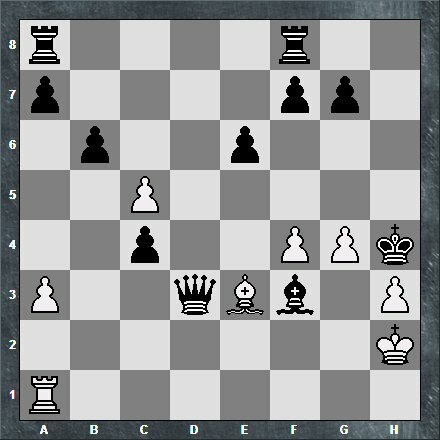 On September 19th, the Colorado Springs Chess Club continued the September Swiss 90 (4SS, G/90+30).